Almost all people like customization. I know you also like it. Apart from improv8ing your dekstop performance and its speed you will like to make it awesome. I always change the customizations and designs of my desktop and give it some unique look, and all of my PC users always ask me why my PC is better than their. But, at first you may want to know some tricks to improve PC performance. In this post I will provide you a way to customize your folders and icons. Many people likes customization and keep looking and tweaking their design. If you are the one than you will like Folder Colorizer. Previously I have shared your some Beautiful Windows 8 Themes. It was popular for many days. With this software you'll be able to customize any Hard Disk Drives (even Local Drive). 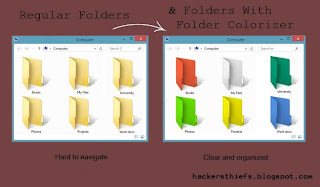 Now after that you have downloaded Folder Colorizer & you'll have to install the it on your PC. After installing it.Just right click on any folder you want to customize and click on Colorize! which you see in the context menu. Now you can choose any color and design which will look good to you. That's all! Enjoy doing cool customization on your PC and design your folders easily. Keep visiting for more tweaks.